Welcome change, transformation and swift movement! Our new year is surprising us all as Divine demands sudden change and release from our old out dated methods of living. We are all being challenged to dig deep within ourselves not to find our hidden ugliness but another aspect that can be just as scarey to accept, our beauty. Our beauty is not something we wear on the outside, but a loving heart that loves fiercely, a power that drives us past what we perceived as impossible and into a new world of belonging where we reveal all of ourselves. Now that we know what lurks in the dark we find ourselves learning how to accept the beast within. You are not alone in this reflection of self. As we come to the most challenging parts of our own evolution the most powerful allies are ready to step into the light and help us. You may be surprised who shows up now in your dreams and meditations. Do not fear and push away this help if it arrives in a unexpected form. Often the guides that come are exactly what your soul needs and is ready to heal a long past that is ready for a fresh start. An old being of love and wisdom offers his wisdom this month to humanity to heal the old misunderstandings, the old fear and mistrust. The dragons dream with us and are ready to help. Are you ready to stand in the flames and become whole today? 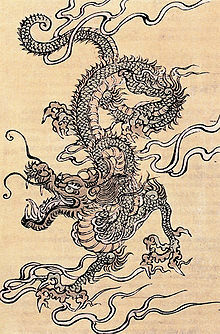 Enjoy Grandfather Dragon and his message from the Dragon Council. I remember the old days when you called to us. You blew your mountain horns and rang the bells not in warning but as a call to wisdom that all those seeking truth knew the wise ones, the dragons had come to the call. We have always guided those beings of Earth Mother. We are the council of elders ever watching the world evolve, opening the doorways of energy and change. Humans have called to us many times through the ages and from every island where you call home. As you changed we showed you loving power, wisdom and balance, we always came holding a mirror of truth to your own challenges. As you grew in power and confidence we showed you your future and you saw in yourself the lust and greed rising and you become fearful. You blamed us and chased us away as you raised the axe to the sacred white tree of wisdom and created a world of suffering. We watched sadly, raising our wings to create the veil between the worlds to protect the world of spirit and beings that could not live with you anymore. We’ve watched as you experienced the rise and fall of kingdoms, kings and countries. We came to those few who remembered how to call to us, that could stand before us facing themselves and were not afraid. But even old dragons like me long to spread their wings again and roam this Earth Mother free on the winds. We watch you now more than ever. Your world has changed again and we have ended our long cycle of holding the veil. We hear the call of the horns and drums to those few who remember the old ways and old councils of wisdom. We spread our wings touching your conscious minds in dreams, daydreams and art. We come because you call to us, the wise ones and we are here to help you once again. Put aside the old fear, the mistrust from an old world that did not want to hear the truth. Trust instead with your heart, with your ever burning spirit of passion that beats in your heart. We see the greed and lust starting to fade away and many of you are looking for us with conscious glowing eyes. We see you facing the beast within and reaching for an understanding that your inner dragons, or demons, are not something you have to fight, but instead something you must accept. This beast you fight, be it cancer, ego, ignorance or corruption is only you looking back from the mirror of life. Are you not tired of seeing the world only in black and white, good or bad? Do you long to be at peace with yourself and in harmony with the world around you? How can you be I AM when you are not seeing all that YOU ARE? Stand up to yourself, stand in the fire of truth and see all that you are. Watch as it blends into a powerful being of light; all that you judge as bad, all that you seek as good combines into a new being. You are all of creation. When you see and accept the entire truth of yourself you can respect the perfect symmetry of life within. It is when we respect self we see and respect all of life around us. This respect radiates out in all we do. There is no fear, no doubt and no resistance to life because balance is natural and easy to maintain. Where do you start little one? You start today, right now. Can you hear the horns? Feel the drum of your own heart beating, calling us. We are here roaring your sacred name, calling the wisdom within to shine through your confusion to the surface. Let your fear go, we are here not to devour you but to reveal your true power within. Reach out to that spark of life within your heart and take hold. Let it burn bright and clear. Let that knowing of love and determination fill you. Hold onto your light with all your focus. No one can steal this light, no one can put this light out, and it is your divine connection to creation. This light is within all of us and is what connects you to all of life. Breathe life onto this little flame, let it grow in your heart. See your life infuse with loving light flames burning away mistrust, fear and doubt. Watch as your choices in life become clear, loving and balanced. And when the roar of love climbs out of your throat know the path being cleared will only take you to the loving future you deserve. No more hiding your light within my little ones. It is time to reclaim your power of love within and bring this loving change into the world! Call to us little ones! We are ready and willing to help you. Beware! What you focus your light upon you create. It is time to focus this fire of creation to your dreams, your positive changes for your communities and for a new balance within the world. Your family is all here to help you, are you ready to join in? Are you willing to blow the horn and face all of yourself? We are watching, we are ready and the time is now to begin a new partnership on our Earth Mother. Let the light of love shine!